Hometown driver #5, Pete Anderson Jr., ( left), took control of Saturday night’s HOTWOOD 100 feature for the Havoline Western Late Models at the Stockton 99 Speedway from the start as he looked to capture his first win of the 2006 season, but Mark Holeman, of Los Altos, #15,had other ideas. (right). Holeman, a 20-year-old mechanical engineering student at Cal Poly-San Luis Obispo, patiently reeled Anderson in until he was in position to get underneath him on lap 81 to make the pass for the lead and take the win. "I really didn’t think we could win tonight, but everything just worked out. I can hardly believe it," said Holeman. "I can’t thank my parents enough. They pay the bills and my dad maintains the car. I just come in from school on Friday and drive it." With his car going away, Anderson was just able to hold off a hard charging Dave Byrd, #21, of Pacific Grove to take second while Pete Hernandez of Sacramento and Manteca’s #61, Guy Guibor rounded out the top five. "Everybody was having trouble by the end, but his car (Holeman) just didn’t fall off as badly as mine," explained Anderson, the defending track champion. "We’ve been off a little lately, but I think we finally have things turned around and headed in the right direction so we’re happy." With his victory in round #3 of the HOTWOOD series two weeks ago, Holeman becomes the first repeat winner in six events at the 99 Speedway this season. Holeman missed last Saturday’s Western Late Model race in order to study for an exam. Which is a bigger thrill, winning a race or acing a final at school? "Definitely winning a race," said Holeman with a smile before quickly adding, "but I need to keep passing my classes so mom and dad will continue letting me race." As is the case in each of the 10 races of the HOTWOOD series, the winner is presented with a trophy from a Stockton 99 Speedway legend. For this race Holeman was awarded the track championship trophy won by Riverbank’s Dan Reed in 1972, 14 years before Holeman was born. Following Richard Petty’s comments earlier this week concerning women in racing, Roseville’s Shannon Mansch; #61, chalked one up for "girl power" by taking a convincing win in Saturday’s 100-lap West Car Series Late Model feature. Mansch, who started from the tenth spot in the 20 car starting grid, skillfully worked her way through the field, taking the lead on lap 57. From that point on Mansch never looked back as Redding’s #2, Kyle Cattanach, Sacramento’s #56, Bobby Butler, Turlock’s Chris Monez and Ted Montague IV of Newark followed her to the checkered flag. "I have had a lot of bad luck at Stockton so this is really sweet. I was actually taking it easy and saving my tires at the end," said Mansch of her first West Car Series win. "This week we have been using a different setup than the one that my husband likes and I think we will be keeping it." Hometown driver Donny Darter #99, led through most of the early laps of Saturday’s 30-lap American Limited Stock feature, but he seemed to get the short end of the stick when a lap 22 restart following a caution was not called back after Stockton’s Joe Allen, (left), appeared to jump the gun. The crowd of better than 2,500 roared with approval when Allen was caught behind a slower car on lap 28 which enabled Darter to retake the lead and capture his first win of the season. "We were surprised on that last restart when the flagman threw the green," said Darter, (left). "I was worried because Joe (Allen) is fast and I knew that my best chance to get by him was to box him in behind that slower car. I planned the move, but whether it works or not is a different story and luckily it did." Oakdale’s #20, Nathan McNeil earned the first win of his career in the Pro 4 Truck feature, which was cut to 20 laps due to several accidents. "It feels great to win, even under these circumstances," said McNeil. "We have had an awesome truck lately. We are right there now in points and we are going to stay there." For the second Saturday in a row a fast track produced three new qualifying records; Mark Henslee of Lathrop in the Pro 4 Trucks – 14.908 seconds, Joe Allen - 15.439 seconds in the American Limited Stocks and Shannon Mansch - 14.328 seconds in the West Car Late Models. Before Saturday’s events began Stockton’s #90, Ron Strmiska Jr. and Lodi’s #2, Michael Wendt made a memorial lap around the 1/4 mile oval in honor of longtime Stockton 99 Speedway supporter Sandy Royce, father of David Royce of Royce Farms BBQ, who died on May 21. The NASCAR Dodge Weekly Racing Series will be back at Stockton next Saturday, June 3 with triple 50 lap features for the Havoline Western Late Models, Grand American Modifieds and American Limited Stock Cars. The Pro 4 Trucks complete the program presented by Havoline/C.L. Bryant in which "double" points will be awarded. 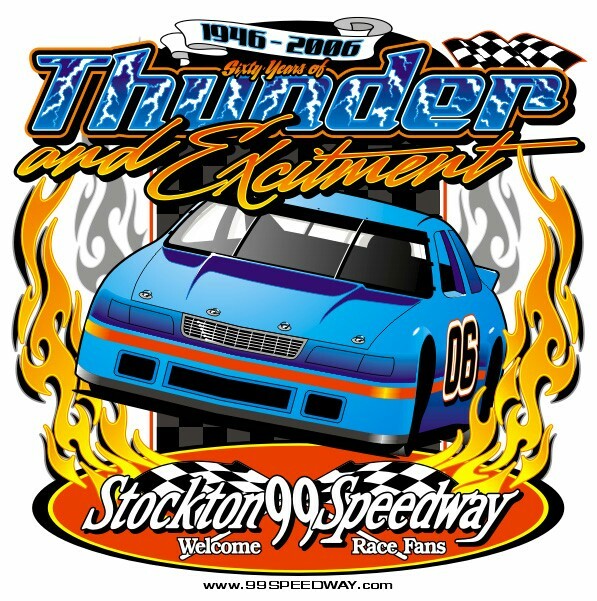 The Stockton 99 Speedway is located just off Highway 99 at 4105 North Wilson Way. If you are traveling south on Highway 99 take the Wilson Way exit. If you are heading north on Highway 99 take the Cherokee Road exit, loop over the freeway, turn right onto Newton Road and then turn left on Wilson Way. Stockton 99 Speedway Info/Race Line (209) 466-9999.